Home Office 365 Group PowerShell How to Change Office 365 Group Name using PowerShell? How to Change Office 365 Group Name using PowerShell? How to change Office 365 Group Name using Admin Center? Expand Groups and Click on Groups link in the left navigation. Click on "Edit" link next to "Name" column in the details pane. On the Edit page, You can change the Office 365 group name and click on "Save" to commit your changes. You can change the name of any Office 365 group using Set-UnifiedGroup cmdlet. 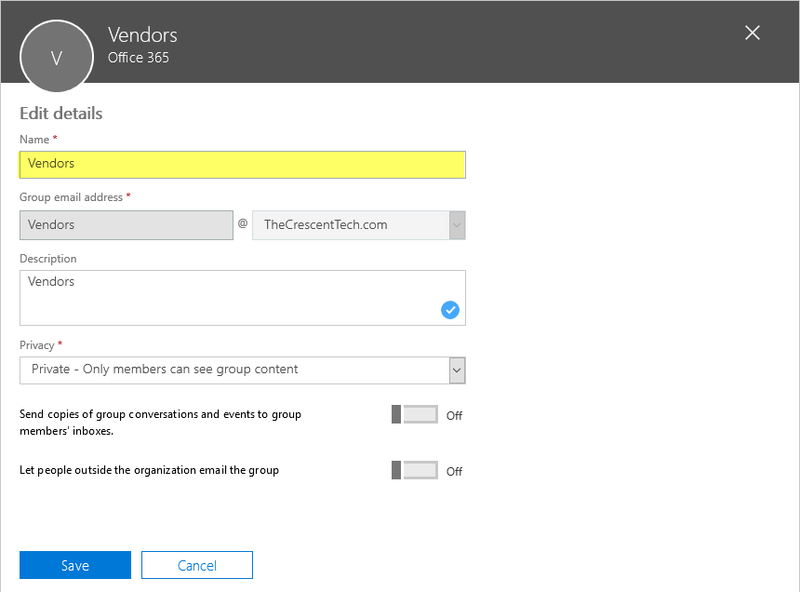 E.g: Set-UnifiedGroup -Identity "group@tenant.com" -DisplayName "New group Name"
Set-UnifiedGroup -Identity "Vendors@TheCrescentTech.com" -DisplayName "External Vendors Group"
This sets the display name of the Office 365 group with Email "Vendors@TheCrescentTech.com" to "External Vendors Group"